Before smartphones, back even before the Internet and personal computer, a misfit group of technophiles, blind teenagers, hippies, and outlaws figured out how to hack the world's largest machine: the telephone system. Starting with Alexander Graham Bell's revolutionary "harmonic telegraph," by the middle of the twentieth century the phone system had grown into something extraordinary, a web of cutting-edge switching machines and human operators that linked together millions of people like never before. But the network had a billion-dollar flaw, and once people discovered it, things would never be the same. Exploding the Phone tells this story in full for the first time. It traces the birth of long-distance communication and the telephone, the rise of AT&T's monopoly, the creation of the sophisticated machines that made it all work, and the discovery of Ma Bell's Achilles' heel. 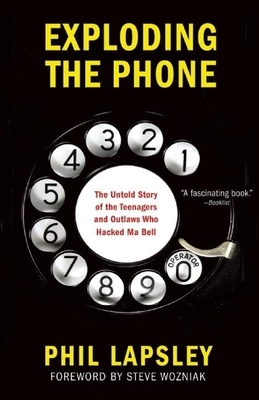 Phil Lapsley expertly weaves together the clandestine underground of "phone phreaks" who turned the network into their electronic playground, the mobsters who exploited its flaws to avoid the feds, the explosion of telephone hacking in the counterculture, and the war between the phreaks, the phone company, and the FBI. The product of extensive original research, Exploding the Phone is a ground-breaking, captivating book. Phil Lapsley co-founded two high technology companies in the San Francisco Bay Area and was a consultant at McKinsey & Company where he advised Fortune 100 companies on strategy. He holds a Master's degree in electrical engineering and computer sciences from U. C. Berkeley and an MBA from the MIT Sloan School of Management. Lapsley has been interviewed by NPR and the BBC and quoted in The New York Times and Boston Globe on telephone and computer security issues, and is the author of one textbook, sixteen patents, an Internet standard, and many technical articles. "A fascinating story about a period of time that I lived through but didn't know much about. I can't imagine how much work Lapsley had to do to write this bookit is remarkably well-researched, fun to read, and deserves great praise. "Vint Cerf, Internet Pioneer and Chief Internet Evangelist, Google, Inc.